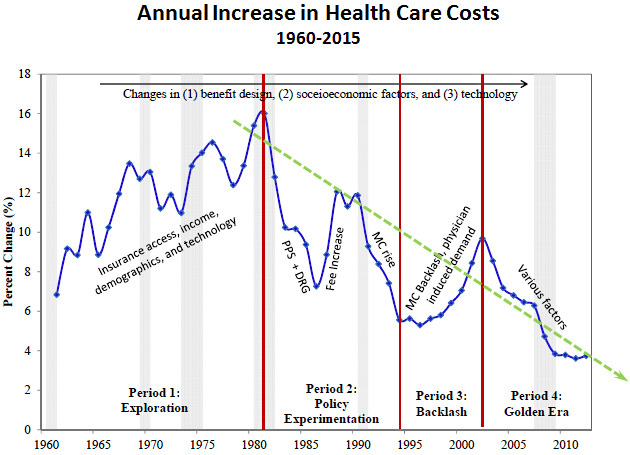 Home › Commentary › Inflection Point: Might Health Care Costs be Manageable ? Inflection Point: Might Health Care Costs be Manageable ? In addition to the proverbial certainties of death and taxes, for most of my adult life we have been hearing that baby boom demographics will blow up Social Security and health care costs, and possibly destroy our ability to pay for these and other government programs, when that generation gets old. And, thousands of baby boomers are now turning 65 each day. But, with surprising forethought, especially compared to the frustration of current American political debates, a bipartisan commission (and Congress and the President) addressed Social Security in the 1980s, with a payroll tax increase and other changes, to keep the system solvent through about 2035. Some additional changes will be needed to keep the system fully funded, but they are quite doable. Meanwhile, double-digit annual health care inflation was taken as a given, and by far the larger problem. And, with more people getting older, and wanting/needing more expensive health care interventions, the assumption was that health care costs would explode and become completely unmanageable. A recent paper from USC’s Schaeffer Center for Health Policy and Economics suggests this may not be true (see chart below). And, regardless of the eventual impacts of ObamaCare on costs, the cost trends for the past decade have been downward. From a peak of 16% annual increase in health care costs in 1980s, we now experience a world of 5% or lower cost increases. While death and taxes remain unavoidable, it would be a happy surprise if baby boom health care cost increases turn out to be more manageable than we all expected.